Some problems are so complex that even attempting to solve them would seem crazy, at least to most people, organizations or even governments. Sometimes though, when a couple of organizations with unwavering determination and resourcefulness join hands, they can tackle the most complicated problems. Following is a description of how Door Step School, Vibha and some committed donors are making a difference in the lives of children of migrant workers. The right to education act which came into effect earlier this year is expected to make education accessible to nearly 8 million children in India between the ages of 6-14 years who are currently out of school. It guarantees free education for every child at a neighboring school. Sounds like a panacea for India’s child labor and literacy problems, isn’t it? But what if a child has no neighborhood? As ludicrous as it sounds, it is a reality for the children of migrant construction workers. The most obvious symbol of India’s booming economy is the new construction going on in all parts of the country, especially the big cities. This brings a lot of migrant workers to the cities. Depending upon the need, these workers set up base at a construction site for a duration ranging anywhere from a few days to a couple of years. When their job there is done, they have to pack up and move to another site across town (or sometimes even out of town) without much notice. Even if a child was enrolled in a school, the child might have to drop out without any notice. There is no guarantee that the new location will have a school nearby. This uncertainty further kills the motivation of the already de-motivated parents when it comes to sending their kids to school. Their attitude is: why waste time and effort when there is not going to be any continuity for their kid’s education. They would rather have the kids help at home. As a result of this, one can see many children either taking care of younger siblings or loitering around hazardous construction sites at an age when they should be in school. This is no small issue. There are more than 1500 construction sites in Mumbai alone. The estimated number of kids that go without education at these sites is closer to a million. Other cities have similar numbers. The Indian government did try to address this issue in a 1996 regulation by mandating that every construction site should have an on-site school for children of the construction workers. However, due to lack of enforcement, very few construction companies provide such a facility. Contractors and ‘thekedaars’ at these sites do not want the additional responsibility of running these on-site schools. DSS founder Rajanitai Paranjpe decided to meet this challenge head on by bringing schools to the construction sites. She established ‘Door Step School (DSS)’ in 1988 in Mumbai for this purpose. DSS seeks to educate the children at these construction sites through their ‘Non Formal Education’ (NFE) centers so that these children can later have the opportunity to be a part of the formal education system. Trained teachers spend eight hours every day, starting at 9.30 am, teaching children at these NFE centers. Children are taught basic alphabets and words and are then taught to string words together into sentences. Basic math skills such as addition, subtraction, etc are also imparted to these children. The short-term goal is to enable these children to read and write so that they can be ready for main stream schools. But there is also a larger goal. Irrespective of whether all these children will get an opportunity to attend a mainstream school or not, Rajanitai believes that it is important to ‘sow the seeds of knowledge and get them to accept education as a part of their growing up days’. The main goal of DSS can be summed up in this quote by John Lubbock “The important thing is not so much that every child should be taught, as that every child should be given the wish to learn”. To set up a NFE, DSS approaches the concerned builders and obtains permission to teach the children at these sites for free. Some builders are receptive to this idea but every so often a builder will refuse to provide any facilities for the school. This hasn’t deterred DSS. 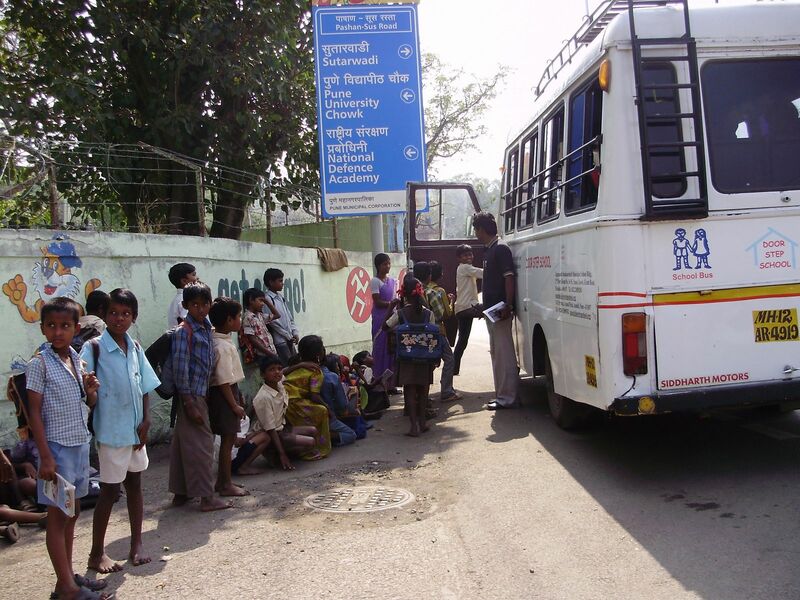 To address this challenge, DSS has added ‘School on Wheels’ i.e. buses that have been converted into attractive class rooms. These buses take the classrooms to the construction sites. All this is great, but what happens when a child’s family moves to another construction site? 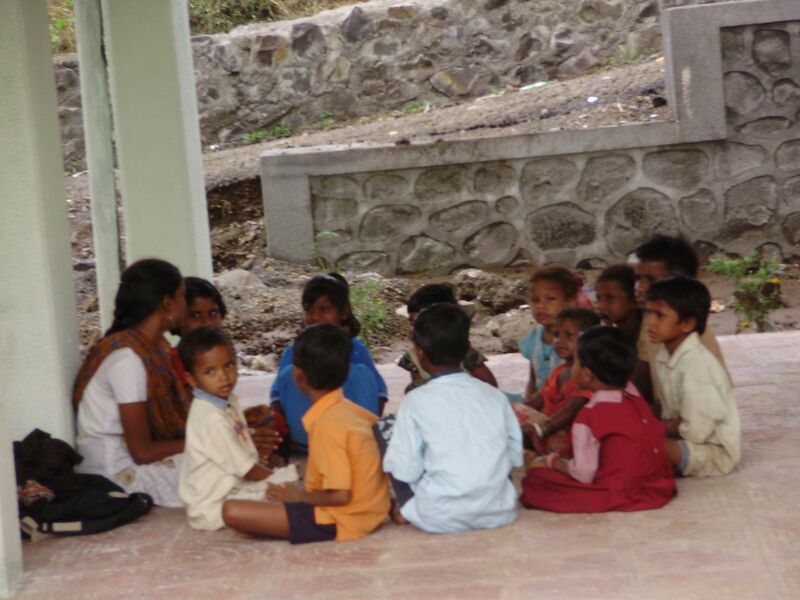 DSS currently has around 80 NFE centers in Mumbai and Pune, so the child can continue education at another NFE. To facilitate this, DSS gives each child a book called ‘Majhe pustak’ (my book). This book has all the information about the child, his/her current NFE etc. When the child moves to another site, the new NFE teacher can use this book to know about the child’s progress. The children are also taught to dial DSS’s number from a pay phone, so if there is no NFE at the new site, the children contact DSS. DSS then sends workers to the site to study the feasibility of opening a new center. As you can guess, all this requires substantial funding. DSS gets a lot of funding from individual donors but that is not enough to sustain day-to-day operations as well as grow. That is where organizations like Vibha come in. Last year Vibha disbursed $65,000 to DSS. But our responsibility does not end with money. As social entrepreneurs, we are heavily vested in the success of each project. In addition to the funding, Vibha also provides guidance and innovative ideas to DSS. One such example is the introduction of the concept of a ‘Child Friendly Builder’. Earlier some builders were skeptical of DSS and would not allow NFEs on their premises even though government requires it. With Vibha’s guidance DSS was has been able to convince some builders to take an active role in building and sustaining the NFEs on their sites. DSS now recognizes these builders as ‘Child Friendly’ builders. This designation allows the builders to project an image of being a ‘Socially Responsible’ builder. This seems to provide a greater incentive to the builders than the fear of any government regulation. The builders are also beginning to understand the benefits of having children in schools rather than loitering around the sites. Thanks to the efforts of DSS and Vibha, some builders have now begun funding the NFEs at their sites. Vascom is one such builder who provides 100% funding for the NFEs on their site. This is definitely a step in the right direction. With assistance from Vibha and its supporters, DSS hopes to reach the doorstep of every child who needs it . The hope is that someday it will not need Vibha to fund it since all the funding will come from the ‘Socially Responsible’ builders. these is very good social work. What an innovative idea of educating children of construction workers. I am so inspired with this story. Would love to be part of these kind of programs which can make a big difference in long run and will help build our nation.